For centuries Ethiopia's rulers have attempted to establish a strong central government that holds the various peoples to the center on unequal terms. This produced resistance from the various people of Ethiopia which since 1960s mainly took the shape of ethnically based rebellions.After more than a decade and a half of devastating civil war, a dramatic turn of events took place in Ethiopia in May 1991, culminating in the removal of the "Marxist" Derg regime.The new government of EPRDF appears to have devoted to devolving power to regional governments and holding multi party elections.Thus, it is the purpose of this study to assess the post-1991 global politics and the process of democratization in Ethiopia. 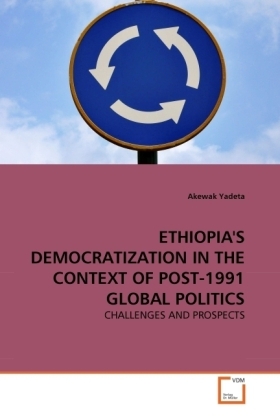 To this end, the process of democratization in post-1991 Ethiopia, the facilitator role of forces of the global political economy and the challenges and prospects of the process are analyzed. The study presents the background that led to the process of democratization; examine critically the process of political democratization (the federalization of the country and the elections held periodically) that has been underway in Ethiopia since the change in government.